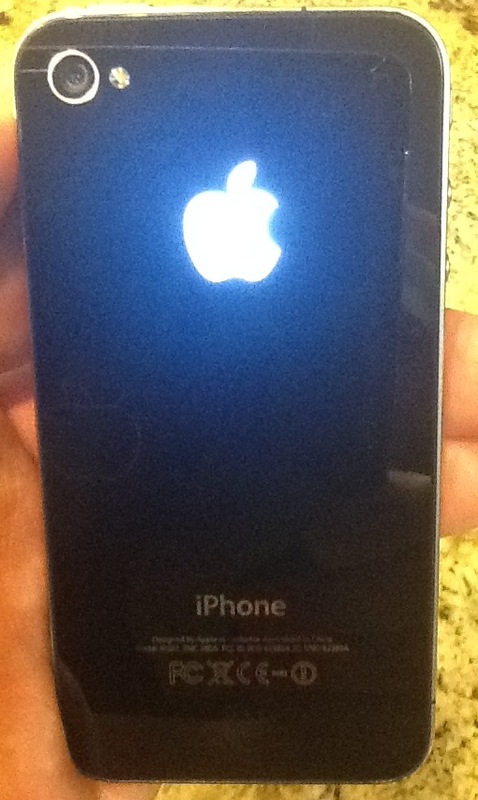 This is a mod to get the Apple logo on the back of an iPhone 4/4s to glow like a Macbook Pro. Be sure to check out the VIDEO BELOW. The kit is from KOGadget and can be ordered from their Facebook page. If you have the mod and need to install, here is a link for the instructions from KO Gadget. There are two separate instructions. One for iPhone 4 and one for the 4s. This link is for the iPhone 4. If you have any questions on the install just leave a comment. 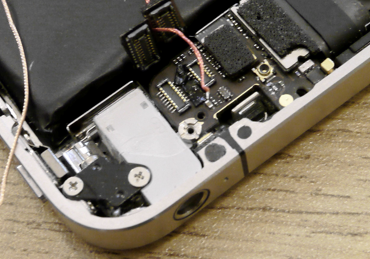 Note: If you’re installing this mod and have some soldering skills. I have found that if you add a bit of solder to the red wire that goes on the connection point it will make better contact and have less issues with it coming off the contact point. Ok for those of you who may want a little more insight on how this is connected here is a little more instruction. 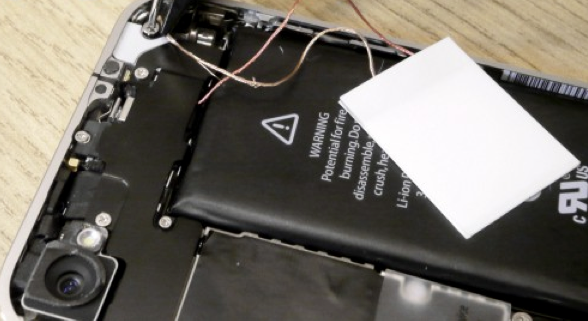 Disclaimer ElectricSproket, it’s owner, employees or affiliates are not responsible for any damage done to any iPhone from this modification or instructional. DO THIS AT YOUR OWN RISK and this will void any valid warranty with Apple Inc.
1st Power the phone OFF and then remove these two screws, they will be either a 00 Philips screw driver or a Pentalobe driver. 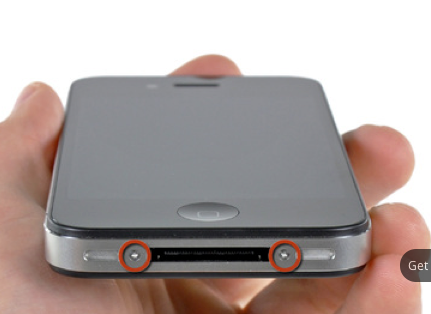 once removed slightly slide the back cover of the phone UP and pull away from the device. 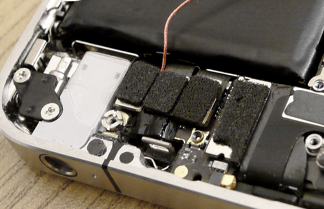 2nd remove the screw for the battery connection. located in the red circle in the image above. once the Connection point is made you can replace the connector. 3rd remove these screws that are highlighted above. Then remove the plate that was being held in place by these screws. 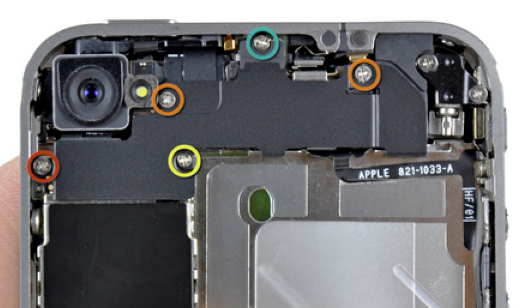 * There are two clips directly below the screw highlighted in orange on the far left of this image. be careful not to bend or break them. once lifted you will use the double-sided tape provided in the kit to cover the 8 dots that are between these two connectors ( Cut a thin piece and carefully place). this tape will also hold the red wire for the led light in place. get the led light ready for the next step. next use a small piece of the provided double-sided tape, roll and fold it over itself and place it over the wire at the connection point. This is to create some pressure to push on the connection point. 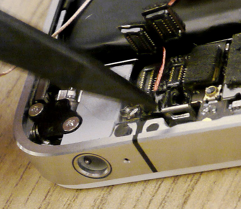 Now replace the metal plate and screw it back in place. Be sure to carefully allow for the red wire to run under this plate. Once this is done you can touch the bronze wire anywhere on the outer metal band of the phone and the led should light up. If it doesn’t then you have to remove the metal plate and the two connectors and reposition the red wire on the connection point. position the led light in the area above the upper left corner of the battery(you can hold the back cover over the phone to get an idea of where this should be). Next cut the foam tape into four strips and place them along the border of the led light to not only hold it in position but to prevent any bleed out of the light. If you have any double-sided tape left over you can use it to hold the light in place. There is also a clear piece of film on the light, you can now remove this. remove the film over the clear apple logo of the replacement back. 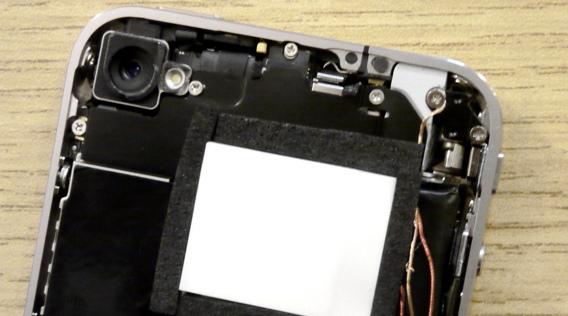 as long as the light is working you can now replace the back cover of the phone and replace the two screw that hold it in place. I saw your post and had to check it out. This is so sick! It’s like making your phone, yours on a personal touch. Thanks for the video showing it can be done and it’s not just a hoax or gimmick. I’ll diffently recomended this page and video to everyone I know. Thanks for the comment and support! We appreciate spreading the word about our site! Thanks. Pretty! I want it to flash red, blue and yellow! LOL. Hi friend, Thank you for the time you put in here. I really battle hard to keep up with the most recent news in the affiliate marketing industry. It\’s not as easy as it seems, but I have a few favs I like. Yours is one of them. I\’ve done online marketing since 1994 and it\’s still a job to get all the things done each day. So I just wanted to say I dig your blog a lot and predominately try and keep up by having secured your feed and loaded it into my Google Feed reader. May your clicks be many, and your conversions greater. Thank you for the compliment it’s very appreciated! I’m happy that you like and admire what we are doing here at ElectricSproket. I hope that you will continue to return and share our site with your colleagues and friends. Hi, I have enjoyed your interesting website. I have bookmarked your site so, will check in now and then. Thank you! Reblogged this on OMG OS X!. Hi, Nice post! I just received my mod-kit and I was wondering something about the ‘contact point’. 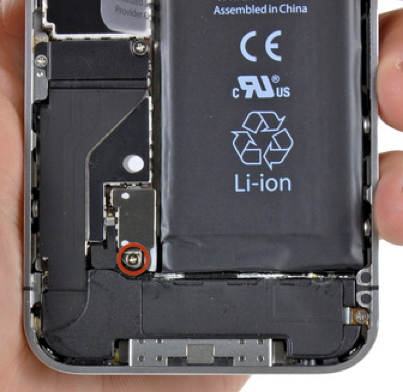 The contact point has two sides, I’m no electrician and could assume it should/can be connected to both side, but I would really like to NOT brake my iphone 🙂 Can you please clarify this bit for me? Thanks!! the contact point your referring to has the silver ends. These being on either end if that very small component. This is where the wire should make contact. it should lay across both of those silver ends. I hope this helps.